My aim – to make the finest bespoke racing straps possible. Tell me what lug size and leather you would like. 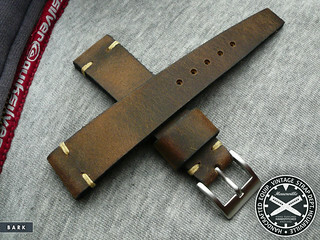 I can tailor a strap to your required wrist size. All straps are made individually, so there may be slight differences in finish – these photos give a good indication of the actual finish, all taken in the same conditions using a white panel light. All straps are available in Rally Pattern (£85), or Plain (£67). Worldwide delivery is free. Click the images below for more photos & details. Price is £85 GBP, which includes a free stainless steel brushed 16mm or 18mm buckle. I can make plain, non-rally/racing straps for £67GBP. If you’d like Tracked/Signed International shipping, there is a charge of £5 GBP. But I can tailor to your requirements. 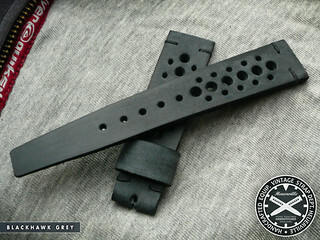 Most of the straps I make are 18 to 22mm lug fitment, as standard they taper ‘vintage style’ to 16mm or 18mm. They are made for an average wrist size – around 6.5 to 7.25 inches (this varies with the size of the watch head). The buckle side is approx. 80mm long, the long side is approx. 125mm, it does vary a little as each is hand cut. I craft them so that they taper in thickness too. I can do pretty much any stitch colour you like! Every single hole is hand punched with a single tool.. not ‘machine punched’. 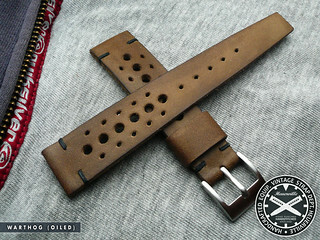 All my straps have a tradition vintage style single wide floating keeper. 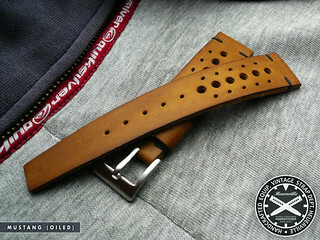 All straps have ‘rough’ straight-cut sides. 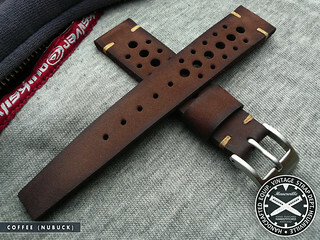 I’d like to find out if these straps are availble for sale. Yes, I am.. I just haven’t got around to sorting out a online shop or anything! With one thing or another, I haven’t had a chance to ‘get the ball rolling’! You have some nice straps and buckles. 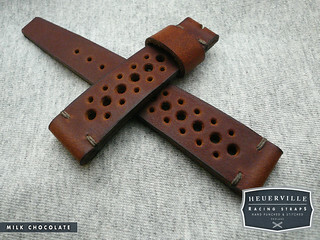 Could you give an estimated price for a strap with Heuer buckle? Looking forward to the opening of your online shop. 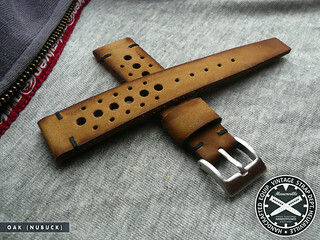 It was a bog standard padded brown strap that I roughed up with the edge of a knife to give it a worn/broken-in look. Any decent quality dark brown strap will do! 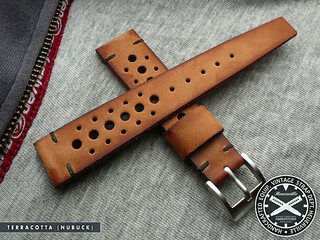 I would like to purchase one of your 20mm straps. Are they available yet? They look great!! I’m in North Carolina. Thanks. I’m in the process of making a new batch.. I’ll drop you an email Kirk. 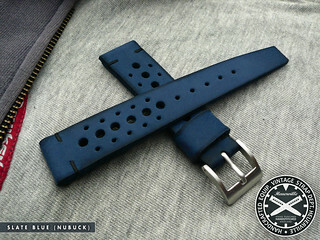 Hi there, I’m interested in one of your straps for my omega speedmaster pro 3570.50. Please mail me if you can sell me one. 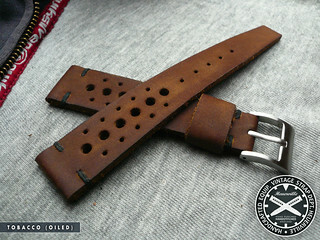 Awesome straps, keep me posted when the next batch become available. can you email me with the logistics of purchasing a couple of straps. Wow! 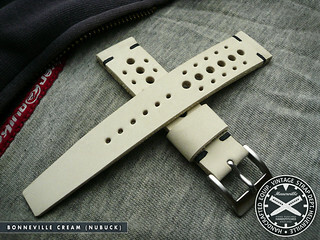 I want a 22mm strap for my Monaco and a buckle. Please let me know if you have any available and how I can purchase one. I’ll drop you a mail Matt. Just bought an Omega speedmaster pro 3570.50 and would like a leather strap ( as shown in the first picture ) and a Heuer buckle that fits. Let me know when I can get it. I would transfer the money first, then you send me the strap and buckle. Hi Bernard – I do have some in stock.. I’ll drop you an email. 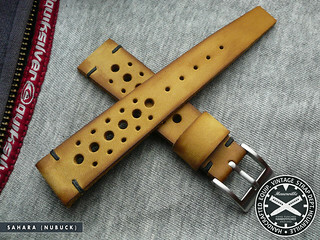 I’m interested in a light tan racing strap if you’ve got one available. I’m presently about to start working on a Mitsukoshi mod for my 3572.50 and love what you’ve done with yours. If you’ve already got them I’d love to order one from you. 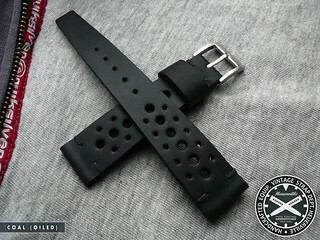 If you’re presently making a batch I’d request a tiny customization: No tang slot on the buckle end — I’d be fitting this into a 16mm Omega Deployant strap. But if you’ve already made them I’m fine without the customization. It’s hardly noticeable anyway. Hey Bill, I do have some in stock.. I’ll email you. I bought 2 straps and its exactly what I was looking for. Beautiful straps. Class act. I want to get a 20 mm Dark Chocolate Brown strap for my 1163T. and one 20mm Mid Tan distressed strap for my submariner 1152. please let me know if stock is available, and the payment method. Hi Dickson.. I’ll email you. Hi I’d like to order a set! Thank you! I wonder if (although it’s indeed a bit custom) it’s possible to get one of your fine strap fitted for the Omega deployant strap (which requires both ends to be near-equal in size). Yep, it’s possible.. I’ll drop you an email. Your leather straps look wonderful. I would like to order one mid tan oiled for my trusty Speedmaster. Could you please email me details on how to order. 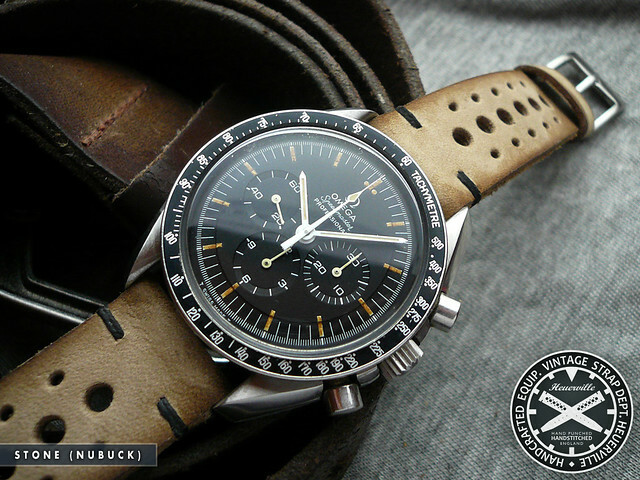 Id like to order a strap for my speedmaster pro also. Are you still making them? Yes, of course.. I’ll mail you. 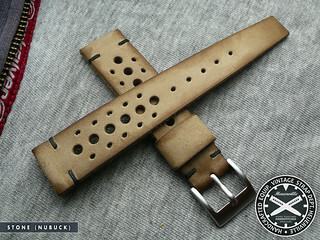 I have been investing in 20mm leather straps because they really look good on vintage watches. But I must say, my Heuerville Racing Strap has been my favorite since I bought them a few months ago. It’s very well made and really comfortable to wear. You cant go wrong on this one guys. Thanks Stewart! Thanks RT, Glad you like ’em. I’m afraid not Peter.. it was a limited stock of leather that I had. I’ll try to source something similar. 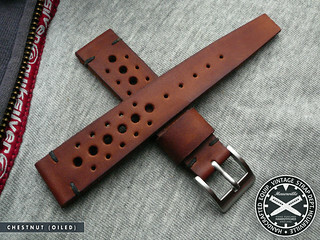 Could you make me a strap for my CS2111 re-issue that tapers from 22mm to 18mm at the buckle rather than 16mm? My buckle measures 18mm and is Heuer marked. I could order a couple of straps if that’d help. Of course Eric.. I’ll drop you a mail. Just wanted to take a moment and thank Stewart of Heuerville for a great strap. The packaging is thoughtful and the strap is superb. Cut it down so it would fit an 18mm deployment clasp. Great job. Thanks again. No problem Arthur, I’ve emailed you. I was wondering if I can get a few straps for my Heuer Camaro. I’ll actually be in London all of next week if I could pick some up? If not let me know how to order. Shaheen, ordering details are at the top of this page. I’ll drop you an email too. Hi, can I order straps for time pieces such as Bell and Ross’ or even autodromo? 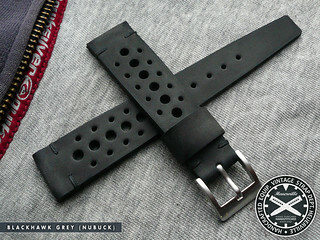 Yes, of course you can, I make straps to fit any standard lugged watch. How long is the wait to get a strap made? Is it 14 weeks as listed in your description? Yes, I’m afraid it is 14 weeks, although I do try to undercut that if I can. 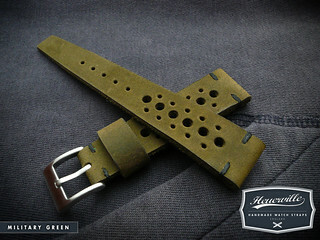 Stewart, my custom made military green strap (22mm wide, fits 20mm lugs) was delivered today. Your packaging was very special, considering that it contained a strap. The handwriting on the parcel and package seemed to have been done by a calligraphist! 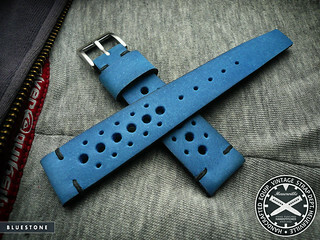 What I really want to convey is this: the strap you made for me is THE best looking watch strap I have ever seen. I do not have the watch with me right now but when the strap is fitted I will send you a picture. Thank you Stewart. Albert.. wow! So pleased you like it. I should hire you as my Marketing man !!! The strap is fabulous. I just hope it fits perfectly. 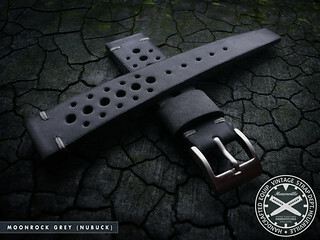 These are the best looking straps I’ve ever seen. 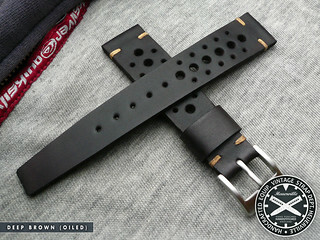 I’d like to purchase the Mustang Oiled Rally strap in 20mm. Would you happen to have any in stock at the moment? Wow, thanks Brandon. I’m afraid they are made to order, I don’t hold stock.